According to our friends at comicbook.com Jon Bernthal will be playing The Punisher on the second season of Netflix’s Daredevil. I’ve said it 100 times, Netflix is taking original series production to the next level! They have put out quite a few shows, as expected, some have been hits, and some have blown up in their faces. This is the nature of this. Daredevil has been a success, I watched the entire season over a night and an afternoon marathon. 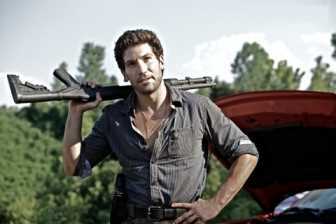 Really great show, and the addition of Bernthal will probably only make it better. He was a great anti-hero on The Walking Dead, and I trust he will bring that to Daredevil as the Punisher. I can’t wait to watch this show! I’m curious what will happen with the “Get Down,” my sister and many others tried out for that show as they wanted “regular Bronxites.” However, I have yet to learn of one Latino that is cast in a major role on that show. That’s another post altogether, and I’ll save that one for my new project, LearnLatino.com! Are you excited about Jon Bernthal being cast on Daredevil? Can I get a date from the subway?